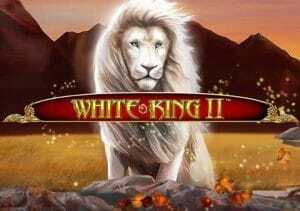 Join the mighty white lion in White King II, a 5 reel, 40 payline video slot from Playtech. This sequel comes with double and single symbols which means you can land up to 10 of a kind winning combinations. There’s also a bonus round where between 5 and 50 free spins are on offer, complete with extras stacked wilds. Stakes range from 40p to £400 per spin. A wild wilderness, complete with the ruined marble columns of a palace or temple form the backdrop to the reels. There you’ll find A to 9 royal values plus a lion cub, an eagle and a lioness. The most rewarding of the standard symbols is the gold crown which pays 62.5 times your bet if you land 10 on a payline. They’re joined by the mighty white lion king which is the wild, substituting for everything apart from the scatter. It also offers payouts that start at 10x for a 3 in a row combination but can reach up to 125 times your bet if you land 10 on a payline. Land 3 or more of the White King scatter to trigger the Majestic Night Free Games feature. 3, 4, 5 or 6 scatters will give you 5, 8, 10 or 50 times your bet as well as 5, 10, 25 or 50 free spins respectively. The single and double symbols are in play during the feature – you can expect to see more stacks of wilds, again both double and single, than in the base game. Retriggers are possible here too with unlimited free spins possible. White King wasn’t the most obvious choice for a sequel but Playtech have created a pretty decent game here. The design isn’t quite top drawer but it’s perfectly adequate. The same is true of the simple gameplay. Hope to trigger the feature as that’s where the best opportunities arise, thanks largely to the extras wilds. It’s not the most outlandish game you’ll find either in terms of sound and imagery or in features. White King II is a solid enough all-rounder though and worth considering if you enjoy the wild theme – it can also pay out 5,000 times your bet on every spin.